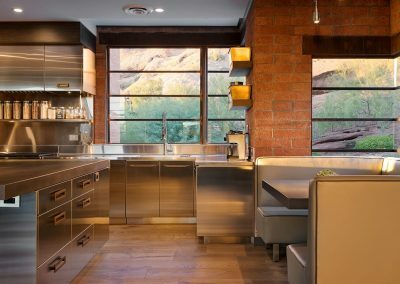 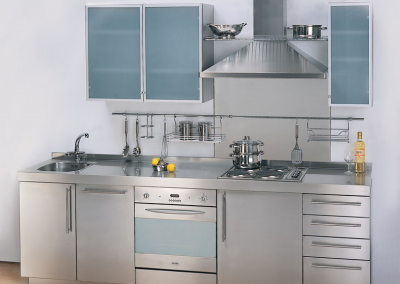 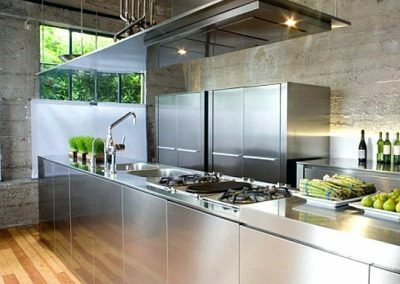 Stainless Steel Kitchen Design & Installation From Gallery Kitchen Design. Our striking kitchens feature flush and water retention edges, impressed drainers and where designed, moulded steel sinks. 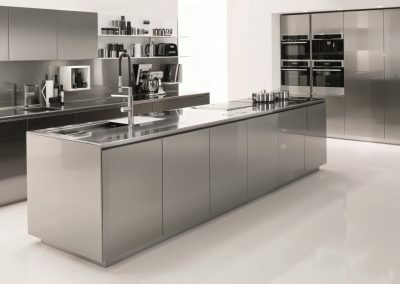 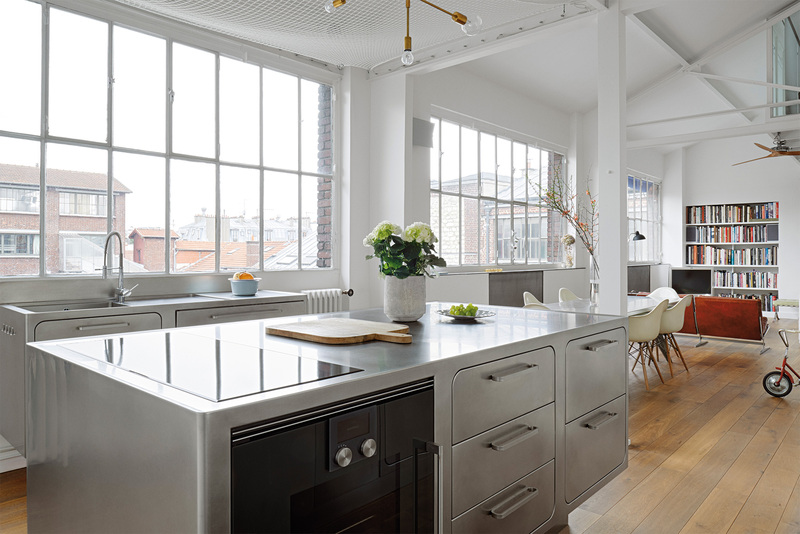 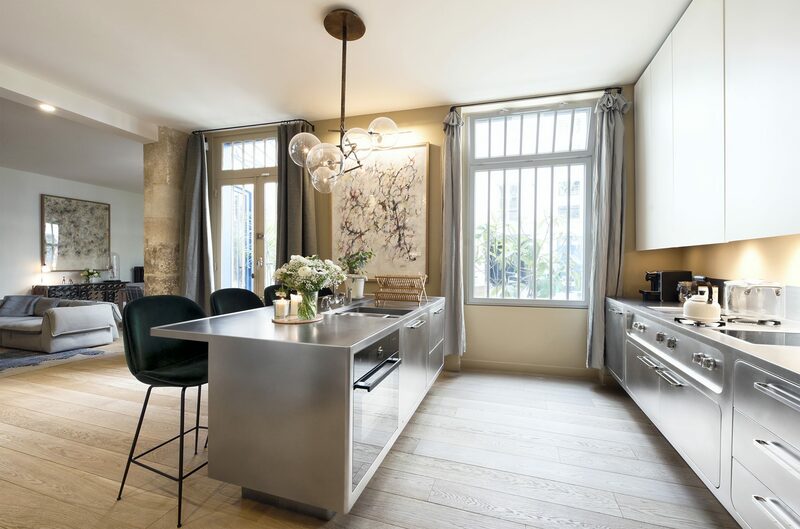 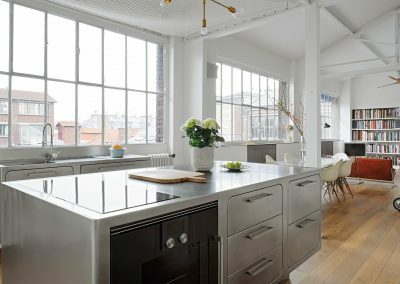 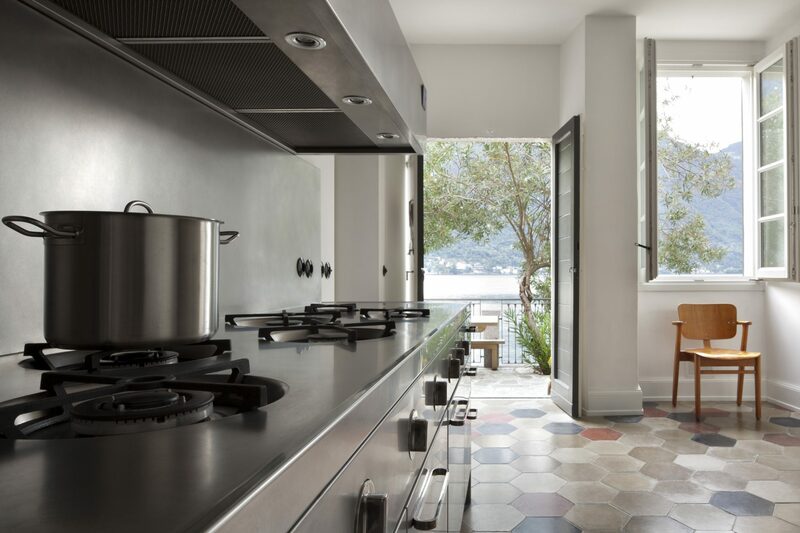 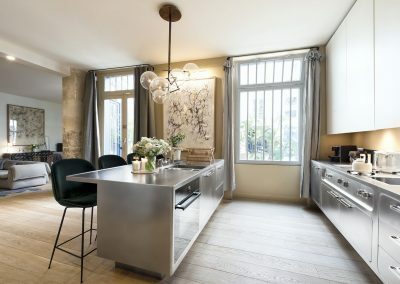 Fabricated in one of the Earth’s greatest structural materials, our steel kitchens attain an undoubted level of domestic sophistication and quality. Catering Kitchens Are Featured In The Catering Kitchen Section Of The Commerical Menu Of This Website. 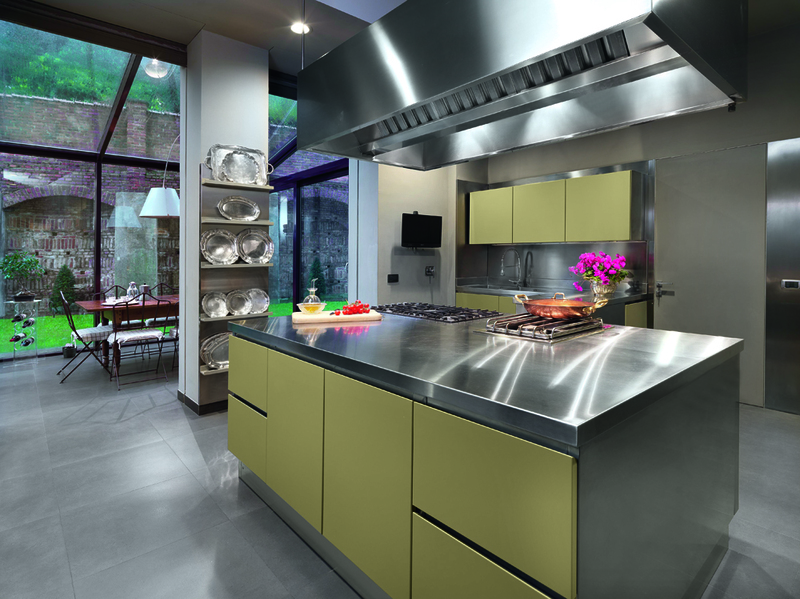 This Stainless Steel Kitchen project is decor finished with white to add colour balance to the kitchen. 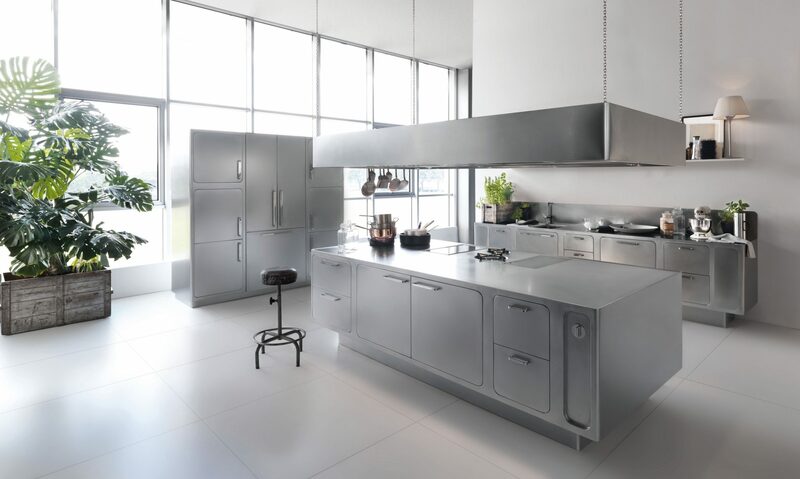 Our bespoke ‘Nu Credenza’ steel kitchen island with adaptable door and drawer system and extraction system. 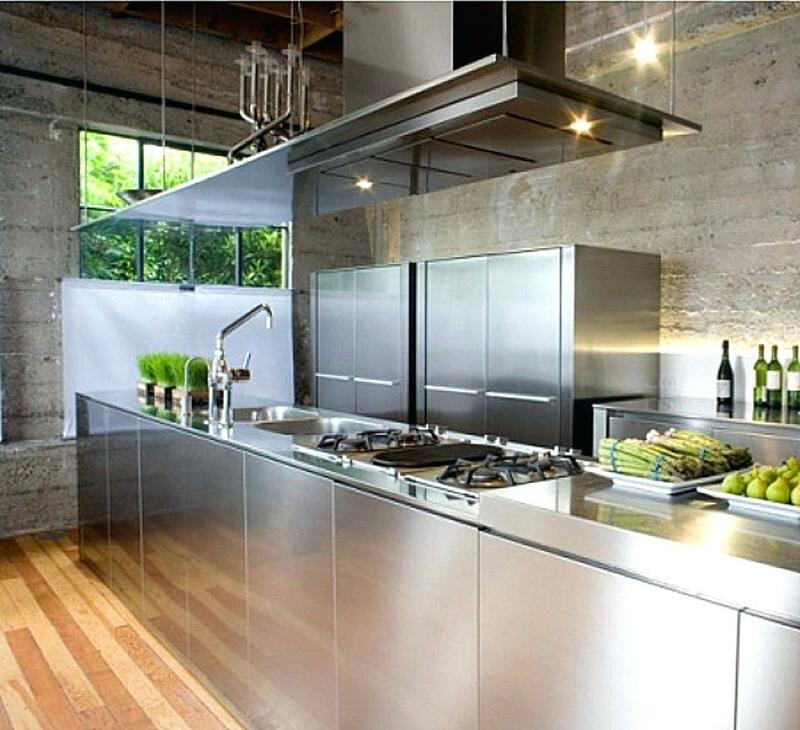 Bespoke Steel Kitchen & Dining Design. 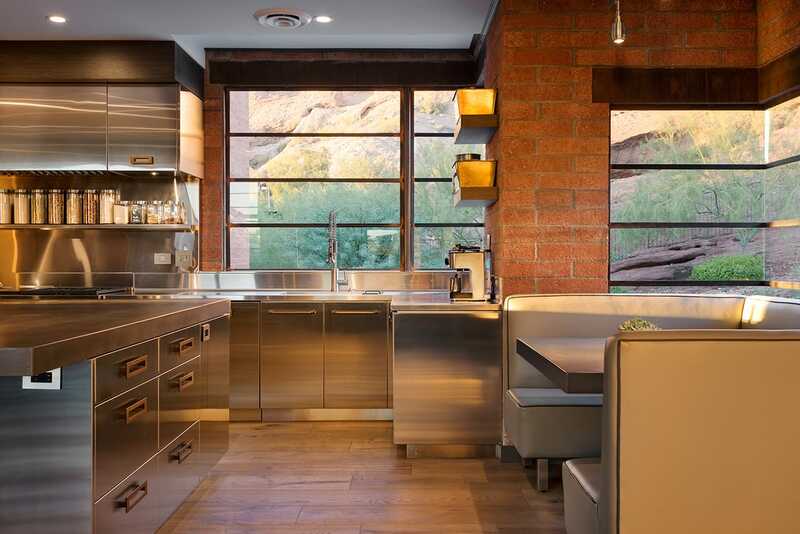 Finishing our steel with care. 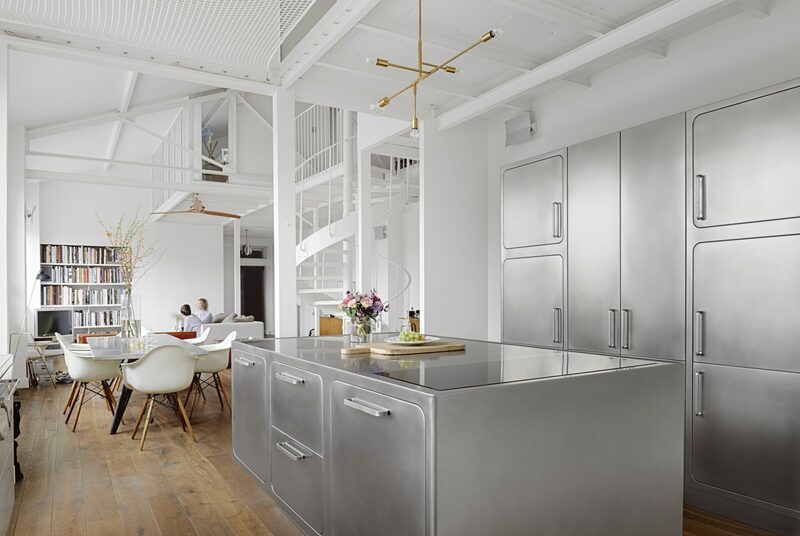 Steel metal working at its best. 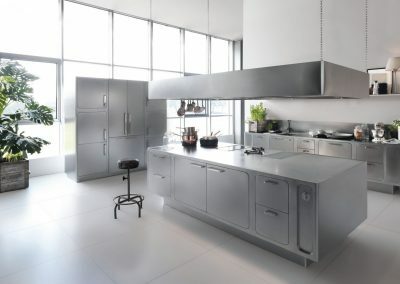 Our Nu Curve Credenza Steel Kitchen designs are made from the very best grades of steel and quality timeless material. 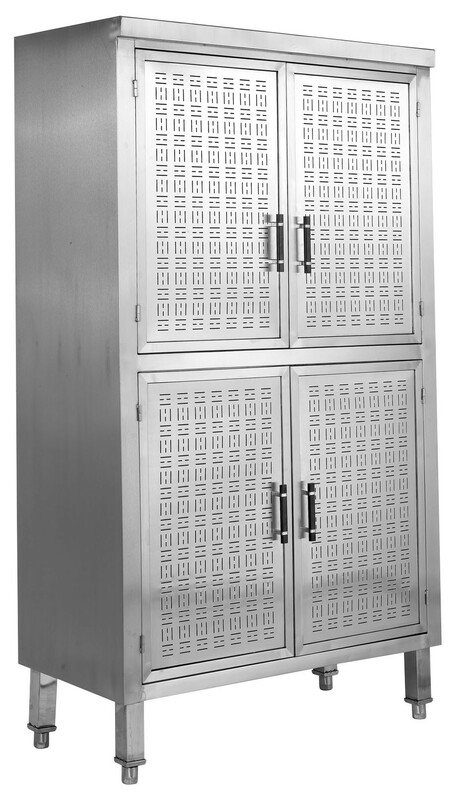 Why not add a steel art storage cabinet to your design to give contrast to your kitchen or dining area. 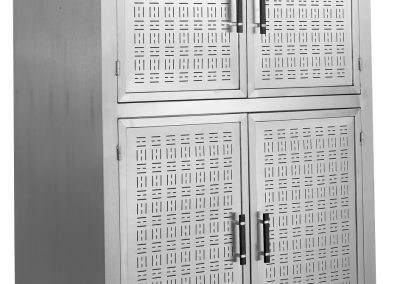 Our steel craftsman ensure checks are carried out for accuracy and safety. 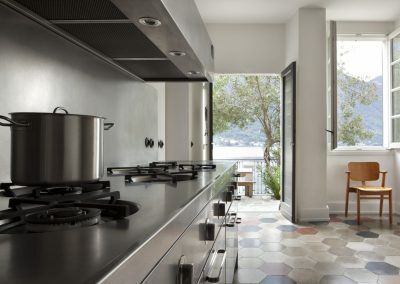 The property, location and views and the elements of fire, water air and energy are the focus points for our designs. 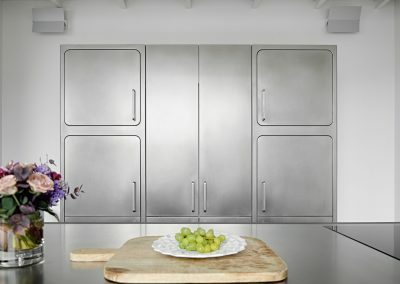 The Painted White Steel doors on this Kitchen added good contrast to the brushed steel finishes and the feature American Fridge freezer. 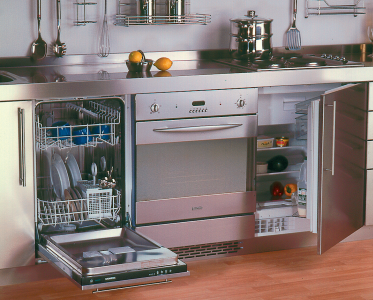 Open steel appliance housing created as a stand alone feature or fused in with designs. 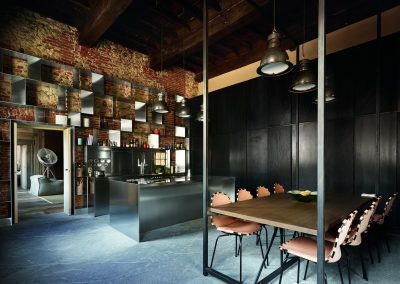 Attention to detail, second to none. 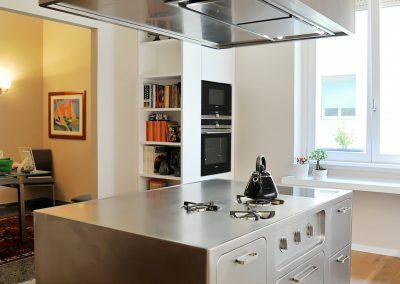 This steel kitchen and worktop design was created with deep drawer system, retro hob in a steel worktop and featurred Integrated appliances and glass finishes complement the kitchen design. 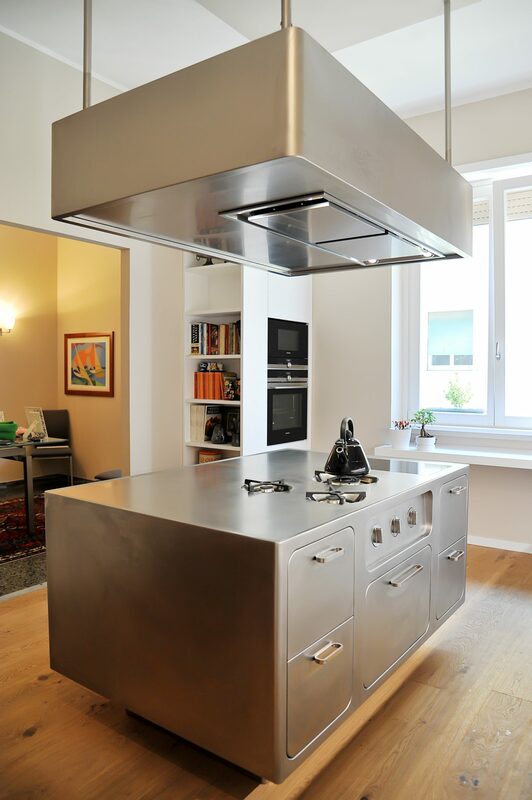 Bespoke sink design in steel. This Nu Curve Credenza Kitchen Island with bespoke mirrored finish was created to give a minimalist feel to the room. 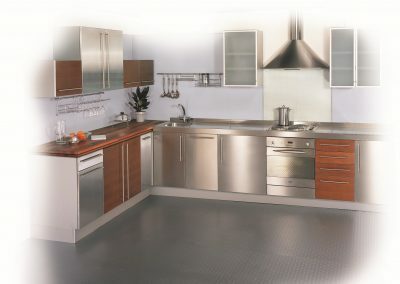 The client here wanted a heavy duty catering style performance kitchen but with traditonal features. Hence the painted cabinetry and timber Island and bar eating top design with fabric finished seating. 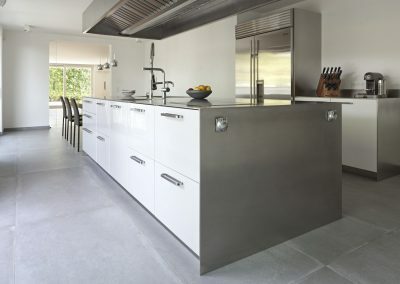 This Polished Steel Kitchen Design was taken to another level here with an extended steel Island worktop formed to create an angled dining breakfast penninsular and bar solution. 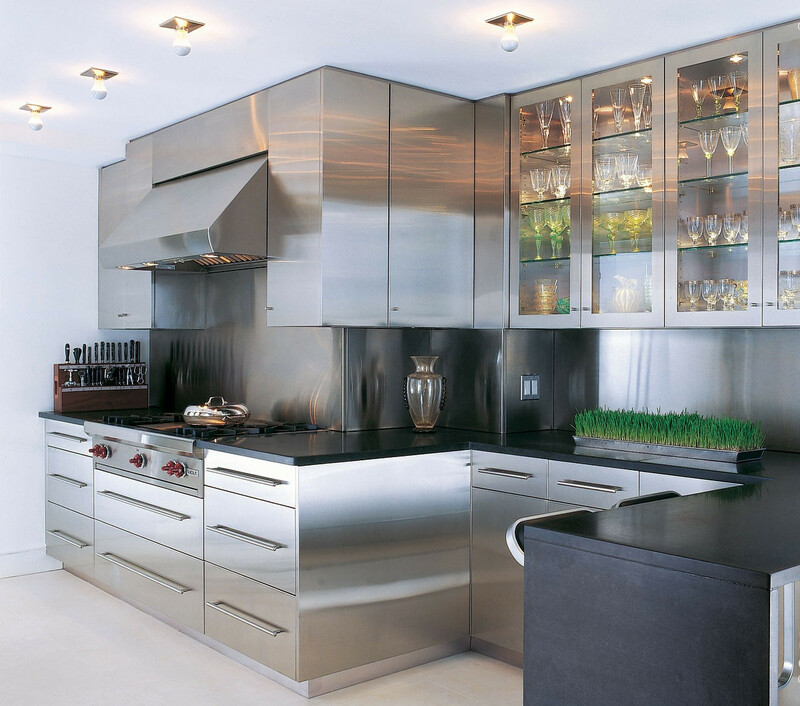 Our steel doors are constructed with strength, sound proofing, hygiene and visual appearance in mind. 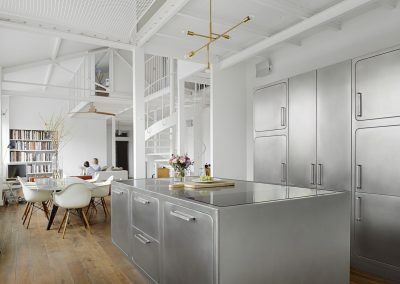 This double Nu Curve steel Credenza Design blended well in this industrial mill conversion project. 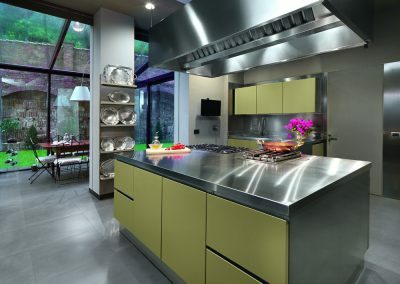 This modern steel kitchen was feature painted in soft caramel cream finish to add colour and definition into the design. It is finished with an industrial styled extraction system and supporting column feature shelving. 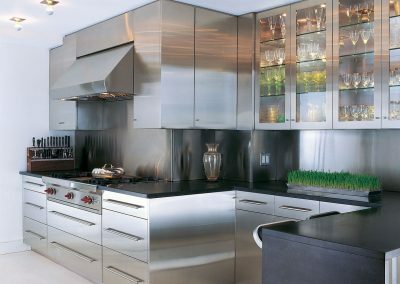 In this contemporary home the client wanted to add our nu curve system steel kitchen to his existing White wall cabinets for maximum storage. 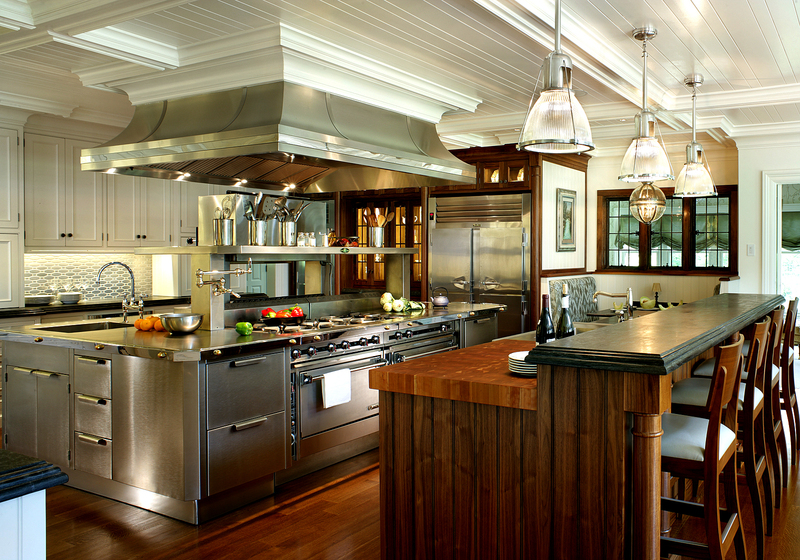 An Island was added with seating and bar run off to seperate the run and add more facilities to the kitchen. 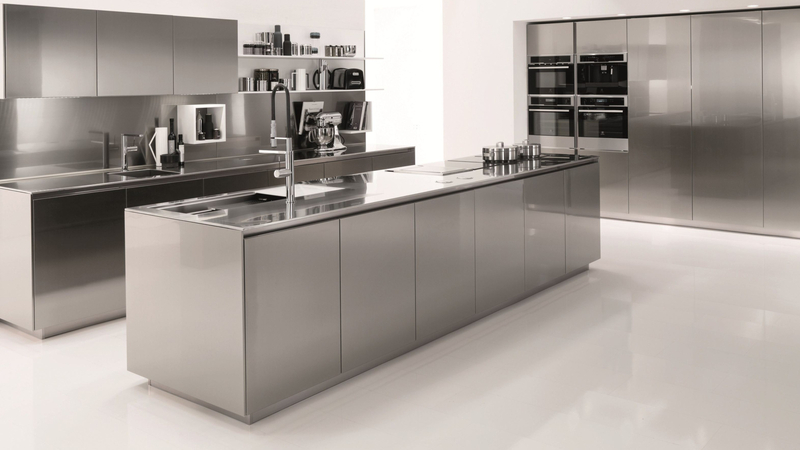 Nu curve steel storage and design demonstrates the compactibility of the kitchens. 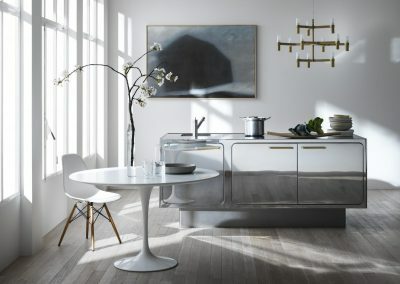 Nu Curve double steel credenza steel and built in storage. 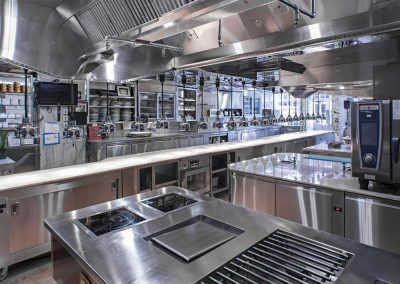 Taking inspiration from professional catering kitchens, this design was completed with a Wolf cooking appliance, extraction and bespoke glazed steel wall units. 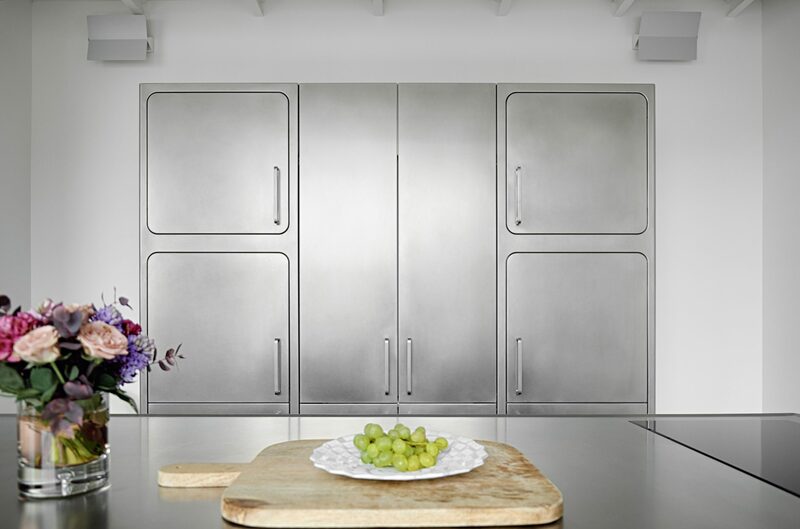 This impression design combines steel with light walnut feature doors. 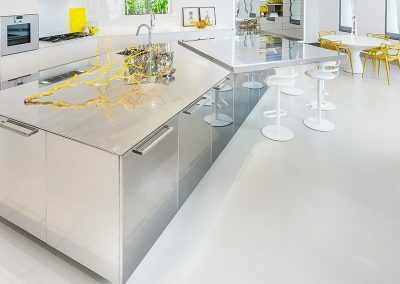 Painted White Steel All Drawer Kitchen Island. 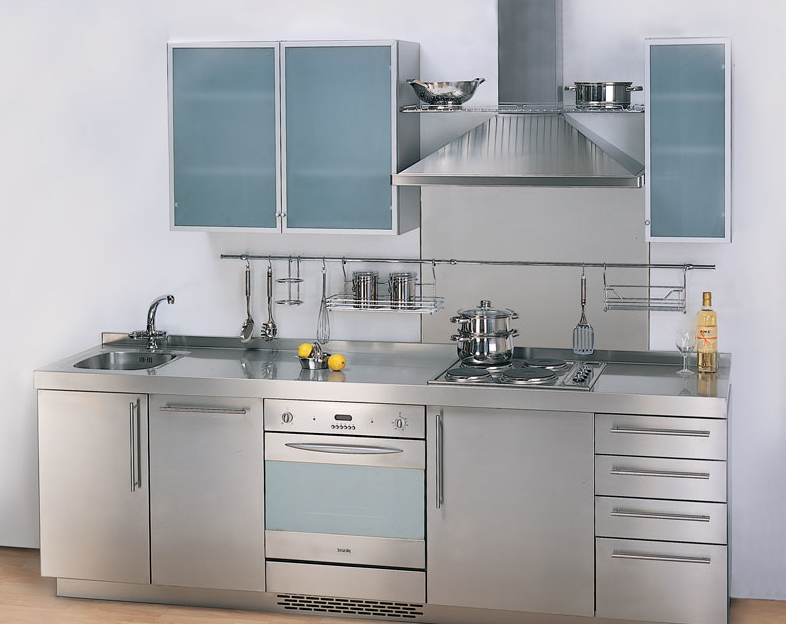 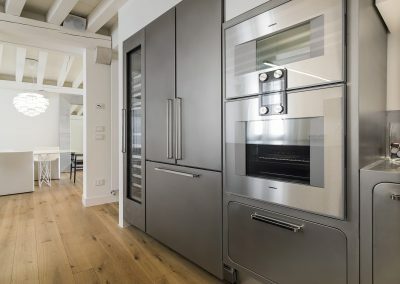 Dependent on the type and range of steel Kitchen required, our steel doors are filled with either honeycomb aluminium, core high density particle board, or high-grade polystyrene.